Don Sager discusses, “How do I? Calculate bonus depreciation under the new tax law?”. 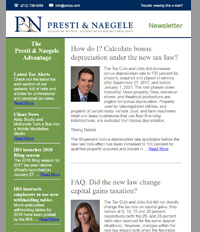 Lisa Varela answeres, “FAQ: Did the new law change capital gains taxation?”. 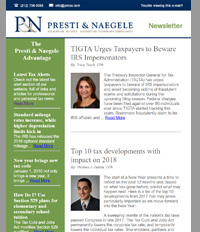 Tracy Tasch discusses, “TIGTA Urges Taxpayers to Beware IRS Impersonators”. Thomas Zanata examines, “Top 10 tax developments with impact on 2018”. Annemarie Aguanno discusses, “Information reporting deadlines coming up fast”. 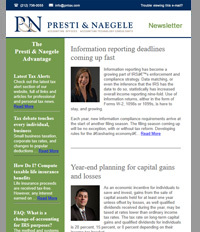 Elias Koumniotes takes a look at, “Year-end tax planning for capital gains and losses”. Don Sager discusses, “IRS Reminds taxpayers of ACA requirements”. Lisa Varela discusses, “Year-end tax planning for 2017”. 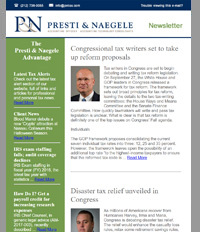 Wayne Naegele discusses, “Congressional tax writers set to take up reform proposals”. Brian Whelan discusses, “Disaster tax relief unveiled in Congress”.